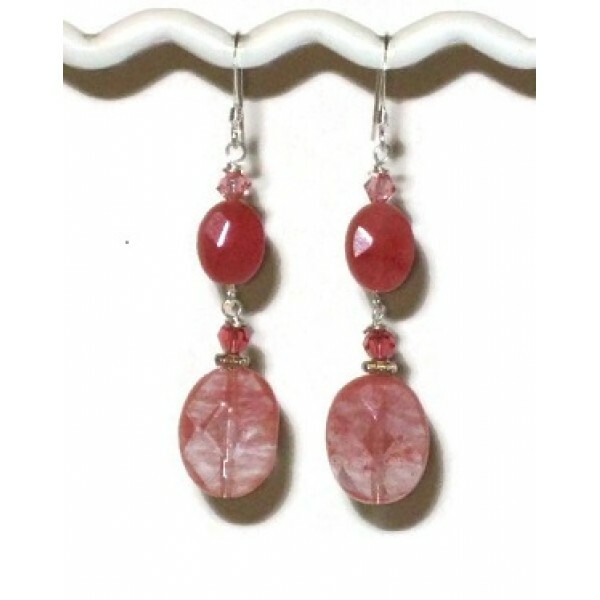 These earrings can give you an elegant and stylish look. They contain faceted cherry quartz and jade beads, as well as Swarovski crystals. They hang on silver-plated earwires, and measure approximately 2 1/4 inches. This expandable choker features a cherry quartz carved flower pendant which is accented with freshwa.. This necklace can enhance any outfit. It features a carved cherry quartz flower pendant which is&nbs.. This 2-inch pendant has a silvertone bail which you can easily hook on to our silver chain necklace .. This fancy coral and pink expandable choker features a mother-of-pearl flower pendant which is..